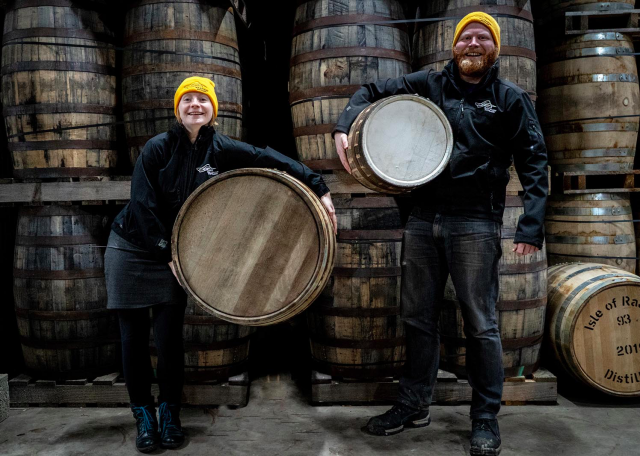 The Isle of Raasay Distillery in the Scottish Hebrides has made available a bespoke 30-litre cask of its single malt to purchase, offering a more accessible format to Scotch lovers compared to the distillery’s standard 190-litre barrels. The Isle of Raasay distillery’s 190-litre barrel (left) compared with its newly available 30-litre (right). The new 30 litre ex-Speyside Scotch whisky oak casks will be available alongside the 190-litre first-fill ex-American whiskey casks, which are hat are currently maturing in the island warehouse. Isle of Raasay Single Malt will be lightly peated and fruity, utilising the best of the island’s natural elements and reflecting Raasay’s rugged natural beauty, and uses water from an ancient Celtic well located behind Borodale House at every stage of production, from mashing to fermentation, to cask and bottling strength reduction, to retain natural flavours in the final whisky. Once the spirit is ready, both large and small casks are filled by the distillery team and left to age into the first ever Raasay Single Malt. Each 30 litre cask is priced at £999, and is available to purchase on Raasay Distillery’s website and in person at the distillery, and will be released and bottled after three years maturation. Buyers are then welcome to keep the cask as a memento. The 190 litre casks meanwhile are priced at £5,000, with around 250 bottles expected from each following a 10 year maturation period in first-fill ex-American whiskey casks. The Isle of Raasay Distillery opened in September 2017 and became the first “legal” distillery on the beautiful Hebridean island.